We know that beginning someone education in the arts can come will all sorts of questions. 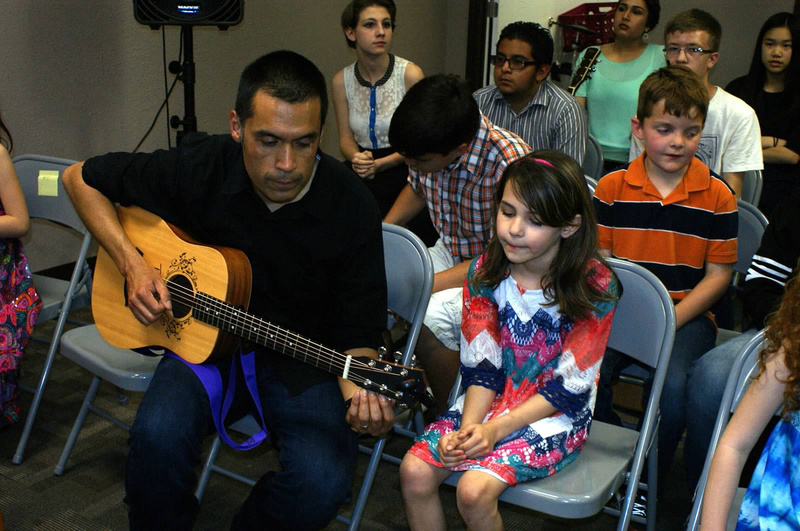 We want you to feel prepared before beginning yours or your child's private music education with Castillo Music Studio, so we have provided a list of commonly asked questions and our answers for you! When is the appropriate age to introduce my student to private piano or guitar lessons? Age and readiness vary greatly. However, there are specific developmental traits you should observe prior to placing your child in private lessons. Students should be able to maintain focus and be productive during the 30-minute lesson in the studio and weekly practice sessions at home. Students can be both emerging and fluent readers as our curriculum accommodates both. Not at all! Adults make excellent students possessing the drive and specific goals required for learning. Instructors have both experience and curriculum for all adult beginners. My student has a special physical/developmental need. Can my student benefit from private music lessons? Absolutely! Both instructors are certified Texas educators able to specifically target your child's needs and learning style. In fact, the instructors have worked with students in the studio with a variety of needs greatly improving mental focus, social skills, tactile strength/development, self-esteem along with the acquisition of new musical skills. What type of keyboard/piano does my beginner need to get started? First of all determine what type of keyboard/piano: digital or acoustic (studio, spinet, upright, or grand) a full 88-key? There are so many affordable options today - music stores, wholesale clubs, Craig's list, and Ebay. Please consider the following when purchasing or renting your keyboard keyboard is best, weighted or touch-senstive keys, pedal, and coordinating bench or chair that fits keyboard/piano size. What type of guitar does my beginner need to get started? There are also so many affordable options music stores, wholesale clubs, Craig's list, and Ebay. Determine whether your student will be playing an acoustic or electric guitar (including amp). Then consider the number and type of strings on the guitar. It is often helpful to bring your student when trying out the different styles and sizes of guitars. We are happy to assist and answer any questions. Are there any other supplies or books that my student needs? Yes. Piano student will have a required set of books to purchase. Guitar students will have a book according to their entry level. These will be discussed and ordered prior to first lesson. Piano students will need a metronome. Guitar students will need a tuner, pick, strap, capo, and music stand. Instructors will place student in curriculum and will be happy to answer any questions. We're so glad you asked! Practice, practice, practice. Practicing times will vary according to student's age and level, 20-, 30-, 45-minutes at least 5 days during the week. More time may be required near to performance dates. What can I do if my student doesn't want to practice? Well, you are not alone as this question does come up a lot in conversation. Prior to beginning lessons discuss the commitment of private music lessons with your student. The commitment includes their consistent practice time during the week and productivity during their private lesson time. Be sure to share with your student that you as well are investing both your time and finances in their music education, and these conversations may need to be revisited as necessary. Any new activity is exciting and enticing in the very beginning, so you will see a lot of non-solicited practicing during this time. As for the long-term and dedicated - Ask any skilled musician how they got to be musically where they are today, and they will tell you that it is hard work, practicing, and dedication and commitment to lessons, performances, etc. AND...a whole lot of fun and wonderful memories! Remember, it takes a village to raise a successful musician. Does my student need to participate in performances and recitals? Absolutely. Performance is the primary goal and purpose playing an instrument for our students. We provide several performance opportunities during the calendar year, a small, private family recital in December and a whole-group performance in May, our spring recital. In addition, please encourage students to perform for you and others in your home, school, church, community, etc as these are all performing opportunities. Can my student learn a specific genre of music in addition to the studio curriculum? Sure! We encourage our students to play the music or genre that they really like. This is also a source of motivation for many of our students. It is important to play for your very own enjoyment. Can private music lessons help my student with their future music education in middle school and high school? Yes, definitely. Private music lessons incorporating music/chord reading and music theory are a great foundation for band, choir and orchestra programs in both middle and high schools and definitely gives students a musical advantage. What do I do if a family member or friend would like to gift or sponsor music lessons? Not a problem at all. We are able to receive gifted tuition, fees, etc. from family and friends of the student. The donor will be placed on e-mail reminder lists for these fees and their due dates.